When this card is sent to your graveyard, you can remove this card from the Graveyard to Special Summon 1 "Peten the Dark Clown" from your hand or deck. "Witch of the Black Forest" meets "Mystic Tomato" meets a Gren Maju De Eiza deck. It doesn't have to die by battle -- that's good. It replaces itself -- good for tribute fodder or defense. It has 500 ATK -- horrible. Anything but Scientist/Serpent could take this out. There isn't much more to say...if you plan on playing more than the normal two Tribute monsters, or need to remove things and thin your deck at the same time, it's worth it in that respect. Bottom Line: Trade it to n00bs who want 3. 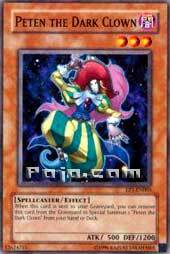 Peten the Dark Clown is, in my opinion, the best card in the Exclusive Pack. With stats of 500/1200, he isn't very powerful; but he can easily be searched by Witch, Sangan, and Tomato. The effect is very good. If he goes to the Graveyard, remove it; and you get another one! Not only is that great for deck-thinning, but it provides a nice little defensive wall as well as gives you tribute fodder for high-level monsters or Cannon Soldier. It's good in a Chain Energy deck, as you won't have to pay any LP to summon it from the Deck whereas your opponent will agonize over having wasted his Raigeki or Dark Hole. Having a bunch of these removed from play might even be useful when combined with Return from the Different Dimension. While having a couple of 500 ATK monsters on the field isn't necessarily worth half your Life Points, you could use RftDD to get the Petens out and then tribute them for something better. Also note that it doesn't need to be destroyed, merely sent to the Graveyard. So if your opponent blows up Chaos Emperor Dragon when you have a face-down Peten, you can just get another one. It doesn't even need to be on the field first. You can discard it with Graceful Charity and get another one on the field! It's a good card, but I have a feeling it will be pretty underrated. Effect(s): Here’s why you’d play it. When this thing is sent to the Graveyard (destroyed in battle, by an effect, offered as Tribute, possibly even sent from the hand to the Graveyard), you can remove it from play to summon another copy of it from your hand or deck. Pretty snazzy. Subtract 0.5 for bans-no Delinquent Duo. Tournament: 3.25/5…and can both help and hurt Chaos and Control decks. Limited: N/A-If it was in a set and common, though, it’d be a great pick. Instead of naming him the Dark Clown, they should have named this card "Peten the Versatile". Or maybe "Peten V. Clown". Because versatile is his middle name. This guy fits into Exodia decks, tribute-heavy decks, and every other form of deck imaginable. There's a complicated saga regarding his effect (related to the Japanese Gilfar Demon ruling; e-mail me for more info) but let's hope Konami doesn't mess up. If we're lucky, this guy will be able to combo with Card Destruction, Morphing Jar, Cannon Soldier, Tribe-Infecting Virus and many, many more cards. If we're not lucky, he won't be able to combo with any discard cost that immediately results in an effect (i.e the aforementioned cards). Regardless, he's still clearly the most reliable form of deck-thinning, making the veritable troop dragon obsolete in all but Dark Paladin decks. Advantage F/H: There are currently about 2-3 commonly played cards in the game that will prevent his effect. They are Magical Scientist, D.D Warrior Lady, and Nobleman of Crossout. That's it. This guy will provide defense against Raigeki, Dark Hole, attacks, Torrential Tribute, etc. Great way to bait out foolish over-extension (i.e. first-turn Raigeki) by your opponent? You bet. Great opening turn drop, second to maybe WOTBF and Sangan? Got it. Guaranteed tribute fodder for your Airknight/Jinzo/Ha Des/Guardian Sphinx? Yes sir. Guaranteed dark monster in the graveyard at your WHIM? Definitely. The advantage potential of this card is tremendous. He's like a scapegoat; he'll almost always lead to "passive" field advantage. 7.5/10. Best Draw for the Situation: You don't want to draw two in your opening hand. However, if you have even one in play, you can basically guarantee that the other two will come out in short order. The list of combos that bring this guy out are tremendous (including Painful Choice). A true stud when you need a defensive wall, a form of guaranteed protection for a turn or two, or when you need tribute fodder. 7/10. Attributes/Effect: After WOTBF and Sangan (definite A BAD System 9.0+/10 monster "staples") this is the best form of deck-thinning in the game, period. Yes, you heard me correctly. Decks such as Exodia that REQUIRE deck-thinning will fall in love with this card. He's also a dark; this will help him with the Crush Card in the future. This guy is an absolute stud in the right type of deck. Best deck-thinning/tribute fodder/monster presence/monster form of protection in the game equals a 9/10. Dependability: As stated before, only two to three cards can disrupt this man's dependability. A 90 percent success rate of deck-thinning, his main purpose, is 9/10. The Bottom Line: Don't be short-sighted and ignore the incredible variety of Peten V. Clown's uses. Cards it combos with if we're lucky: Magic Jammer, Dark Core, Raigeki Break, Card Destruction, Morphing Jar, Tribe-Infecting Virus, and so on. This site is not associated with KAZUKI TAKAHASHI. Yu-Gi-Oh is a registered trademarks of KAZUKI TAKAHASHI. This is NOT an official site. This is a fan site.